There’s a tolerance for difference and eccentricity that not only is real, it’s defining. It’s no accident that there is a very large and growing gay community in Texas. It’s not a coincidence that rogue businessmen (and women) like H.L.Hunt, Ross Perot, and Mary Kay Ash thrived here. It is not mere fortune that nutty fundamentalist churches, unique musicians like Willie Nelson or Leadbelly, and politicians like LBJ and Sam Rayburn called this state home. There’s a guy in this small town where I live (population: 4000) that drives around wearing women’s clothing. Nobody cares. In Dallas, for many years, the Texas Kid filled his yard and covered his home with roadside and junkyard ephemeral art. His neighbors loved him. 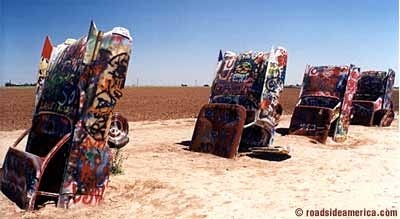 Stanley Marsh planted Cadillacs in the ground near Amarillo in 1974. The whole state knows about and loves that mess of wheatfield steel. The "live and let live" policy of personal regard for the neighbors and their many peculiarities is real. "If it ain’t broke, leave ’em alone" is the motto of most Texans and that makes for lots of surprises over the next hill, and some darned interesting people almost everywhere you go in the state. Just past the tracks, on the other side the old Chevy house, there’s a place that serves the best BBQ you’ve ever tasted. Every town has such a place. Just ask the right people and they’ll reluctantly share their secret, which is almost always located in the expanded kitchen or front yard of an older African American couple. They serve sliced BBQed beef on white bread with a bunch of dill slices and a heap of jalapenos. And that’s it! And it will be the best meal you eat all week! For years I spent a lot of time in small East Texas towns. No matter the time of day, I discovered it was almost always possible to find these little BBQ joints that no health inspection bureaucrats had been to in years (at least in their official capacities!) When it was inside a house, you’d sit on one of an eclectic collection of chairs, get a Coke from a refrigerator, be talked to endlessly by the owner who was also the cook who was also the server, and try to keep the grease and sauce off your lap while you ate the best beef sandwich you had ever eaten or would ever eat. At least until the next town. No habla Ingles. Lots of people here in Texas- some of whose families have lived here for generations and some who crossed the Rio Grande last month in the middle of the night- don’t speak English, or want to, or need to. This was Tejasmexico long before it was Texas, and norteamericanos are the interlopers in many neighborhoods. They’re welcomed, but here, in many places, the burden of communication is on the gringos. As it should be! I’m convinced that some of the animosity aimed toward Mexican-Americans and Mexican-Mexicans (here and everywhere in the U.S.) is not economic, as is claimed. It is simple jealousy over communitas– community enjoyed and lived in real ways by people who never have never been out of community with their families, friends, and countrymen. I used to take my car for repairs to the Naranjas garage in East Dallas. Every day at about 3 p.m. the work there would stop, cases of beer would be opened, and various cuts of meat would be put on a large metal cooker to fry. If you happened by at that time, there might be no one to talk to, but there would always be plenty of people to be with and eat and drink with. No cars would be worked on during that time. But communitas was exploding. Longhorn cattle, llamas, and even camels can be seen in many pastures. None of these animals earn their ranch owners a dime. But they look nice. They’re fun to have. And they keep the weeds down. Actually, the last comment is usually an excuse for the first two comments. Texans like strange things, beautiful things, out of the ordinary things; they like to look at them, no matter that they are money losers. I heard a county extension agent in South Dakota, once upon a time, urge a group of young farmers to plow up everything– from fence to fence. "Turn that dirt into money," he said repeatedly. There is still a deep, deep love for the land itself here that would have gotten that agent booed out of town. Even the huge ranchers, with dozens of oil wells and hundreds of cattle, have that special place on their ranches that is their’s, their’s and God’s. They’ll tell you that with an eye on the horizon and a quiver on their lip. They are almost always some of the most generous people you can meet, too. They know where money comes from. Really. That’s four reasons. I have a whole bunch more, but I don’t want to start crying, too. Come see for yourself sometime. Skip the big cities. Go look for that BBQ place across the tracks, or keep an eye out for a longhorn steer. Then you’ll know you’ve arrived. I saw this described as the “most bang-for-the-buck” video ever. I agree.